With the aim to maximize the available incentives and to achieve low monthly operating costs, this 4.91 kW photovoltaic solar system was designed by Cape Fear Solar Systems using SunPower 327-watt panels, the most efficient solar modules currently available on the Planet. This was the result of 5 years of research involving two different solar installers. There was a lot to learn and having the right installer is critical as there are lots of reasons why a faulty design or installation can lead to long-term issues. We contacted several references from each of the installers to learn more of their experience and any suggestion they might have if they were going to do it again. Once we contracted for the system, installation began in about 4 weeks and we began generating power a little over a week later. 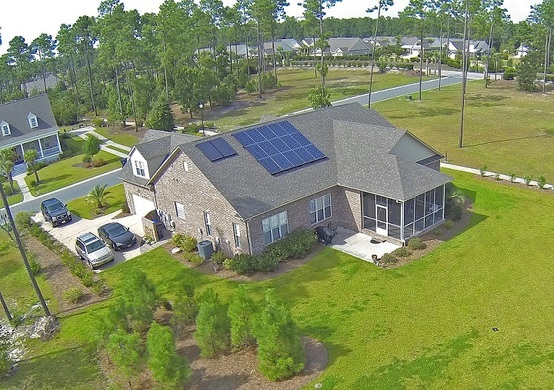 Cape Fear Solar Systems took care of all the details and explained every step in detail to us. It was a wonderful experience. Because the house in Bolivia, NC carries all of the elements of a perfect solar site (no shading, good tilt and azimuth), only one stand alone inverter is used to maximize the array’s output, forecasted at 7,048 kWh annually. The design and the solar modules used blend into the roof line and our neighbors hardly notice they are there. We also added a solar domestic hot water system which further enhanced our system and virtually eliminated electricity for hot water production. This is the first solar system installed in Palmetto Creek in Bolivia, NC, leading the community’s development towards alternative energy adoption. Many of our neighborshave asked lots of questions and some have a real interest in adding solar PV to their homes. We are always willing to discuss our experience and the significant information we developed as we researched the project. As of August 17, we have generated over 19,300 kWh of power. We are very pleased with the system and have had no issues of the last 34 months of operation. As of November 21, 2014 we have generated 14,293 kWh of power in just over two years. The system works great and we are very pleased with it.